I began writing this while in France, but wasn’t able to finish it until now! Day 3 in Marseille and let me tell you – it is beyond anything I could have imagined. I have been dying to blog about it all and finally have access to a keyboard I understand, and the energy to put my experience on “paper.” I was originally going to break this entry up by days (1, 2, 3, etc) but I am going a different route – enjoy! The south of France is not made for tourists. That Marseille is no Paris is evident in more ways than one, but the absurdity of tourists has been most prevalent for us. My sister had notified me that it would be important to know some French to communicate here, but I did not realize the extent of this truth until day 1. On the plane trip over to Marseille I spent a lot of time going through a French/English dictionary, wrote down some key phrases and even had my cousin quiz me after I studied some. It was all very exciting and my main thought was I could at least be endearing if I made the effort to know the language, rather than expect everyone to speak to me in English automatically. I don’t think I could have understood then how difficult communication would truly be. It is incredibly rare to find someone here who speaks any English. At. All. From day 1 Rick Steves, author of our French/English dictionary, has saved our lives one choppy french phrase at a time. Imagine yourself in a brand new country, where no one understands you and you understand no one, you have no phone/way to communicate with the one person you do actually know there, and no idea how to efficiently get around. Imagine that and you have our first several unnerving hours in Marseille! Dictionary in hand, I began every approach with, “Desolay, no parl frahn-say. Parlez vous anglais?” (Sorry, I don’t speak French. Do you speak English?). After which I proceeded to gesture like a mad-woman and speak like a cave-person before finally pointing to what I wanted to say in the dictionary itself. It was mainly by guessing that we made it to the main train station of the city, and only with luck and asking around (in broken French) that we managed to find and purchase a sim card for a phone. Once we had that in order things turned around, as we were able to make contact with my sister, who thank God knows the language and is familiar with the place. However, since she has class until 5:30 everyday, Rick Steves is still our best friend during the day. I feel like we saw everything there was to see in Marseilles. This trip was definitely not a break, everyday was filled with travel and although it was tiring I wouldn’t have had it any other way. We spent a day at Aix en Provence – a young people’s historic city filled with vibrant shops and people. We explored the Middle Eastern market at Noailles. We saw Notre Dame de la Garde, Château d’If (one of the settings of The Count of Monte Cristo) and the beautiful city of Cassis. From all that we saw I have two favorites. 1. Vieux Port – This is one of the first sights I saw in France, as well as one I saw most frequently. The port is full of sailboats and surrounded by city-style dining and shopping. Even though it smelled heavily of fish in this area, it is probably the place I would miss most. 2. Les Calanques – On our very last day, my sister’s host parents took us on a fantastic day trip beginning with the Calanques. 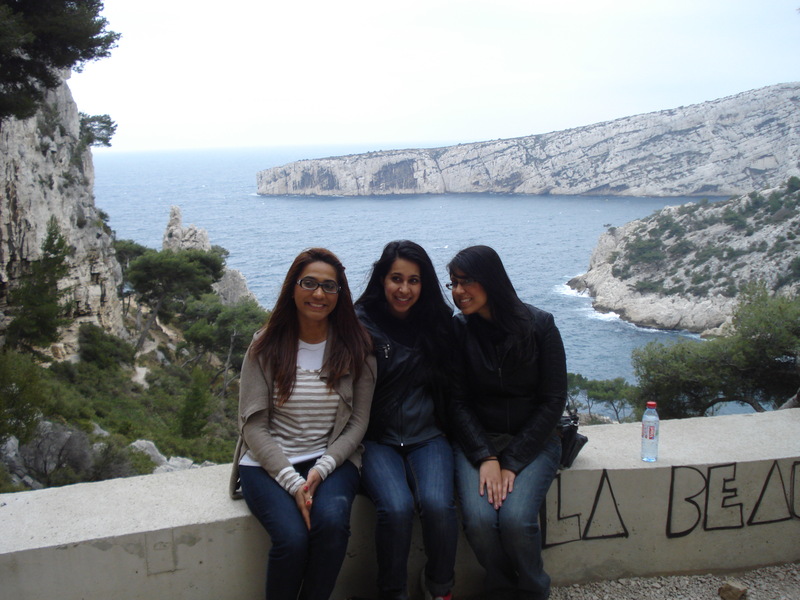 We first hiked way down the Calanques and ended up near the water. Then we climbed all the way up (go quads!) to one of the highest peaks. 2 inspiring perspectives in 1 incredible location. The hike itself, which was treacherous at times, made me feel alive (and hot, sweaty and tired of course). I snapped many pictures but each was snapped with the knowledge that I would never be able to capture its true majesty. This hike, more than any other part of the trip, helped me realize how small a part of the world I am. In a good way – it sort of took some pressure off if that makes sense. Before I left I was instructed by friends to take pictures of all the food I would eat. Well let me tell you, the food in the south of France really wasn’t all that special. The patisseries had some good pastries, and our hotel had delicious croissants but I’m really not sure what is considered typical food in Marseilles. Some locals we talked with couldn’t really answer this question for us either. Marseilles is very diverse and the food reflects this. We saw LOTS of pizza, Indian, Chinese, American and really anything but actual French food. My favorite foods from France were a Mexican-inspired sandwich, and Vietnamese stir fry. We also did see baguettes flying off the shelves everyday! Smiling and being loud is definitely not the norm, and because of this we earned eyes everywhere we went. For the most part though, people were very helpful and willing to put up with our Frenglish. Others, however, turned quickly away back to their own affairs. The host parents my sister is living with showed us immense kindness. Not only did they have us over for dinner, they also had us sleep over twice and took time out of their own weekend to take us to Les Calanques and Cassis on our last day. Beautiful people, and they were definitely the exception to the missing smile rule! Overall this trip to France was an amazing experience that has fueled my travel bug. Can’t wait to be out of the country again hopefully this summer!